Pictures can be a great way to record an object or project, but typically only does so in one perspective. In order to capture things in three dimensions, you’ll need to be able to snap multiple photos and stitch them together with software. 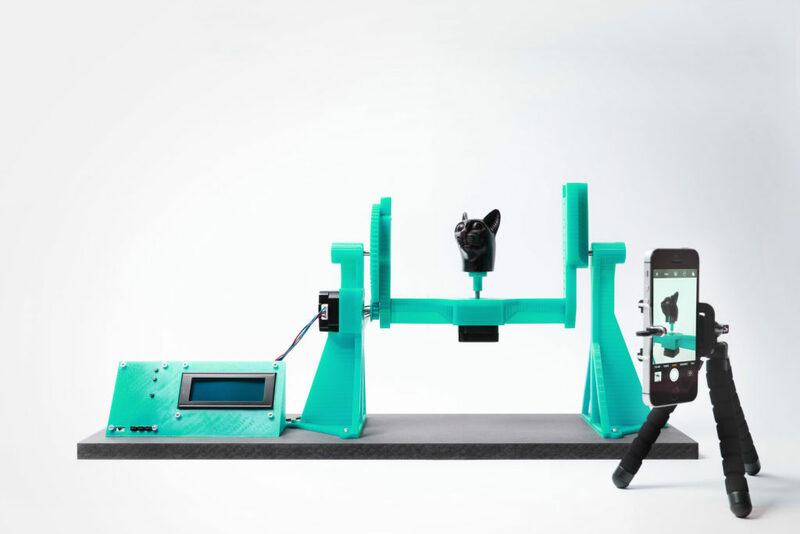 To take all the photos required for this process, “thomas_openscan” has come up with an automated device that rotates the object as needed, allowing him to capture images using a DSLR camera or even smartphone. An early prototype is shown here, which actually moves a phone around the scanned object. 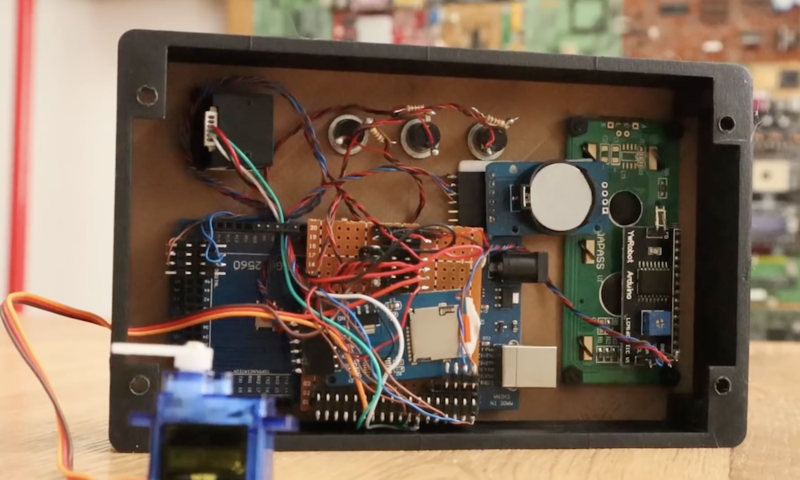 The later, more refined version manipulates the object itself using an Arduino Nano and a pair of drivers to control a pair of bipolar stepper motors. More information is available here and over on Thingiverse, and can be purchased or built depending on your needs. 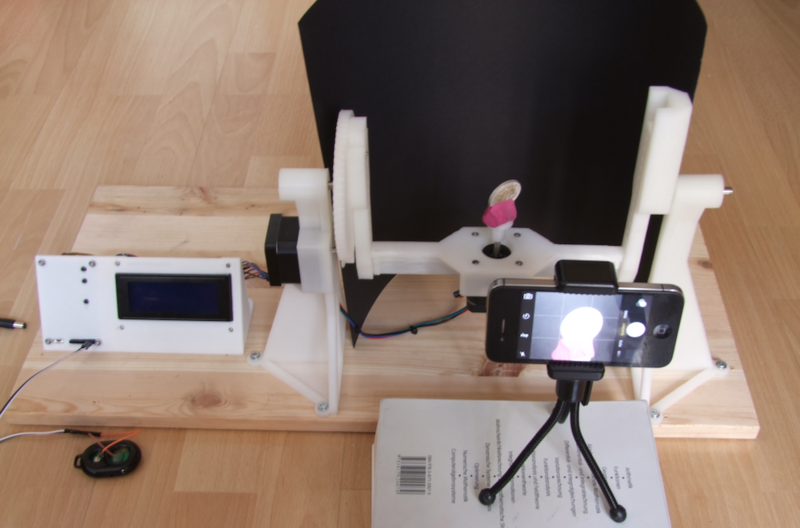 If you need a motorized turntable for filming or simply to display your latest project, here’s an easy 3D-printable option from Ali of Potent Printables. The design takes two forms—one using a full-sized hobby servo, and a smaller version that employs a micro servo for motion, both of which are set up for continuous rotation. Electronics for the project are fairly straightforward, with an Arduino Uno powering the tables via an Adafruit Motor Shield. While this could be expanded for different I/O or sensor use, the clever bit of this configuration is its interchangeable design. 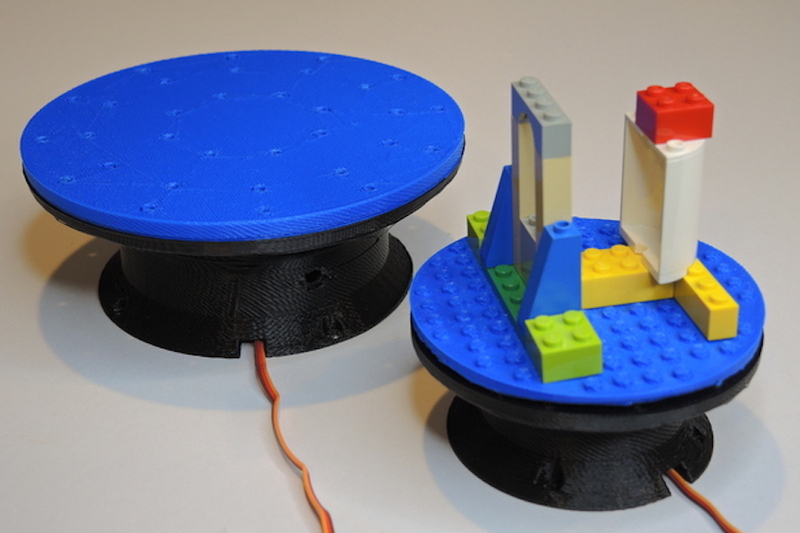 A master circle is connected to the servo horn, while the swappable plates attach to it with magnets, accommodating a flat surface, mounting holes, or even LEGO bricks. While it might seem like a long time away to most people, if you’re looking to make an amazing automated display for Halloween, it’s time to start planning! One idea would be an automated skeleton robot like SKELLY. This particular robot was built using an Arduino Mega, a Cytron PS2 Shield, a modified sensor shield, and a wireless PS2 controller. SKELLY is equipped with a total of eight servos: six for bending his shoulders, elbows and wrists, one for running his mouth, and another for turning his head. There is also a pair of LEDs for eyes, and a small motor in his head with a counterweight that allows him to shake. 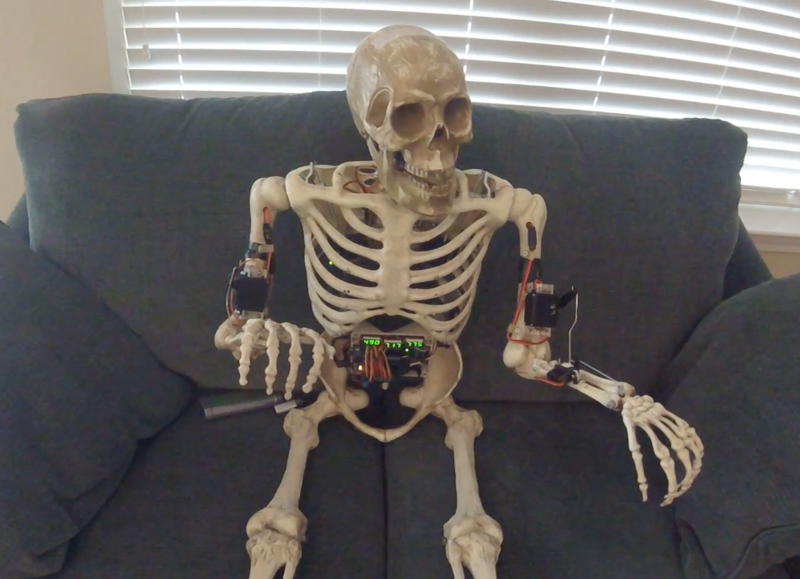 SKELLY is programmed using the Visuino visual programming environment. As seen in the videos below, the robot–which is the author’s first–is quite nimble, waving and moving along with an automatic piano! 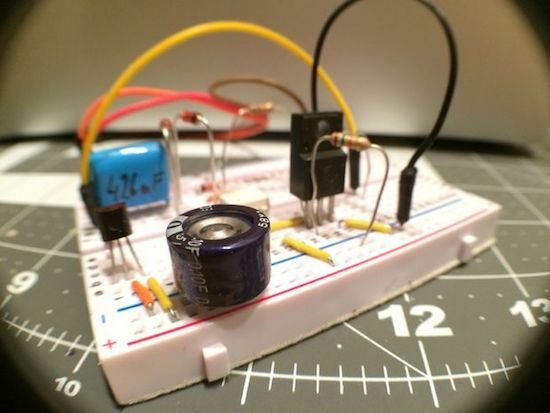 Silencing a smartphone at night isn’t difficult, but if you have a landline, Arduino can help! Before computer hacking/modding became accessible, the next best thing was to creatively explore the phone system via custom electronics. Though this pursuit, known as “phone phreaking,” has largely gone away, some people still have landlines. 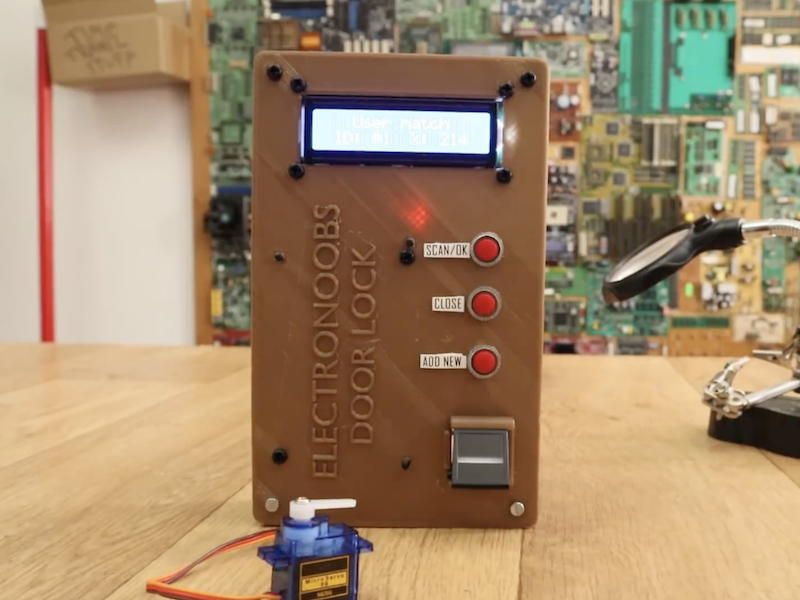 As “MolecularD” shows in this Instructables writeup, with a few components you can creatively trick your phone into not ringing on your end, while appearing to the caller to simply ring and ring as if no one is home. In order to make it much more useful, MolecularD hooked up an Arduino Mega with a real-time clock module to turn the device on and off depending on the time of day. Now calls from phone solicitors, or “IRS agents” at 4 in the morning can be eliminated automatically. As noted, this may or may not be legal where you live, so attempt it at your own risk! Arduino Day: Extended deadline, new events, and more updates! Arduino Day is now less than three weeks away, and we cannot wait to celebrate with everyone on April 1st. So far, we’ve received hundreds of submission from all across the world and are constantly updating our map with new events — which by the way, if yours has been approved, do not forget to add the agenda! NEW DEADLINE: The call for submissions has been extended until March 18th! Remember, participation is open to everyone and anyone can organize event of their own Submit yours here! 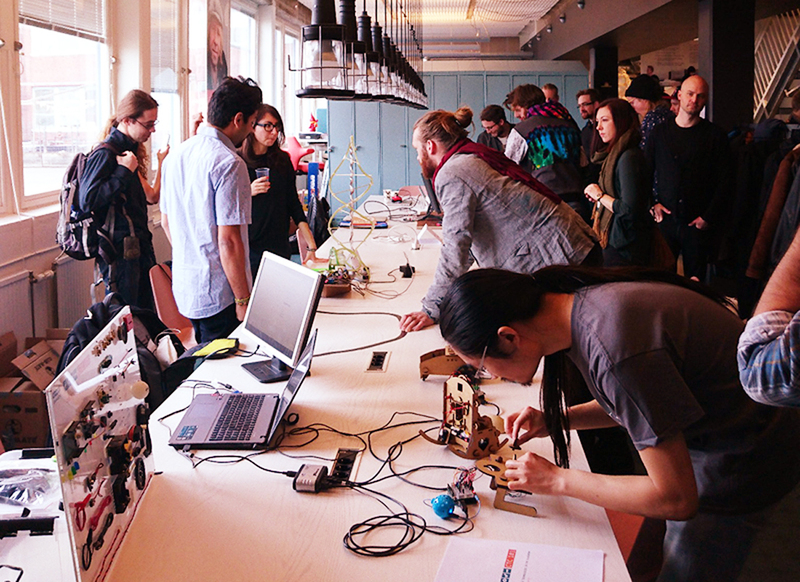 OFFICIAL ARDUINO DAY IN MALMÖ: Aside from our festivities in Turin, the Arduino team will host another official event in Malmö. The program will include a showcase of Maker projects, free activities for kids, and a lineup of talks. Live in Sweden or nearby? Join us! 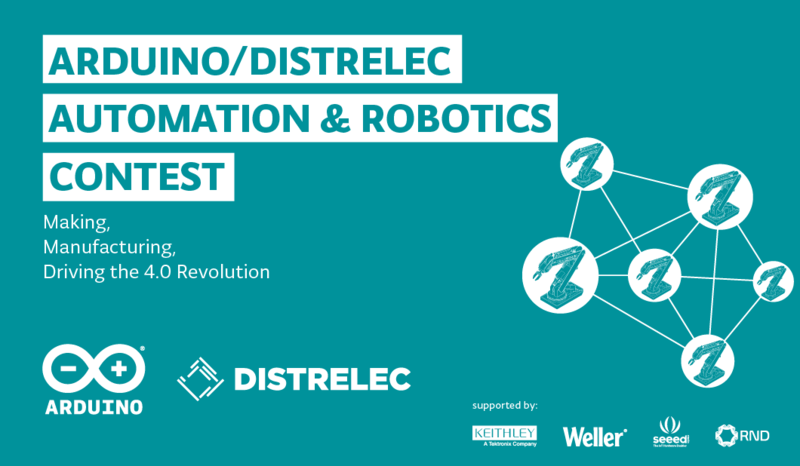 ONLINE EVENTS: Not only will the Arduino community come together at various physical locations throughout the globe, but now several celebrations this year will also be taking place virtually. If you want to host an online event — such as a hangout or a live streamed workshop (we are very open!) — please contact arduinoday2017@arduino.cc with your idea, and we’ll get back to you! Colombini’s Attachment project allows you to do just that, by dispatching digital notes, images or videos gleaned from the Internet into the atmosphere. 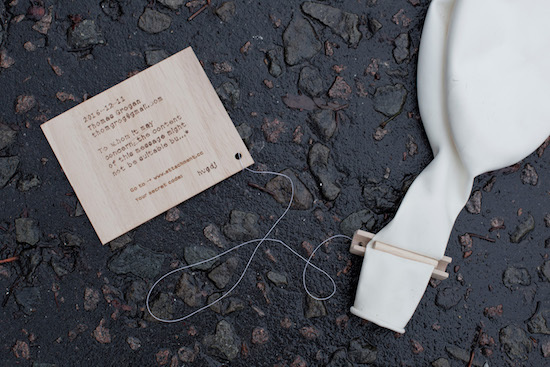 Once the Arduino Mega-driven device receives this input, the message is laser-etched on a thin piece of balsa wood, then released into the air (though a human has to ‘reload’ after five launches). Word space is limited to a Twitter-esque 120 characters, but the finder of the balloon can access any additional content that you include through a code on the project’s website. Software includes PHP / MySQL database, vvvv (take the message from web database, layout of the message, transform it and stream it to the engraver) and Arduino IDE (controlling all the mechanisms). 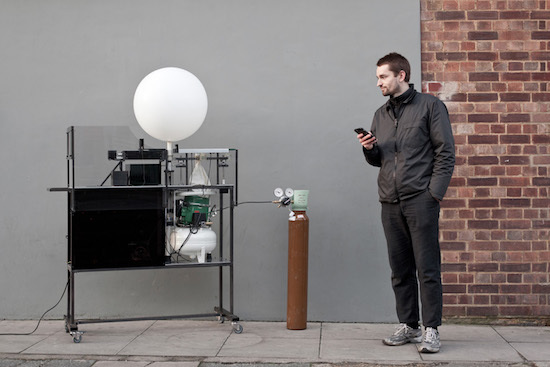 Hardware includes an Arduino Mega, NEMA 23 motors + drivers, linear actuators, a Bambi air compressor, helium cylinder, Festo pneumatic components (helium + air valves, helium and air pressure sensors, pneumatic cylinders, DHEB) and MicroSlice engraver (based on Arduino Uno). You can read more on this project as well as its previous version. Additionally, visit the Attachment.cc page to input your own message! As many of the followers of my blog know, the Teensy 3.1 and Teensy LC have been my favorite microcontroller boards for the past couple of years. The Teensy 3.1 has since been replaced by the slightly better Teensy 3.2, which has a better voltage regulator but is otherwise pretty much the same as the 3.1. I’ve been using the Teensy LC with PteroDAQ software for my electronics course. I’ve just noticed that PJRC has a Kickstarter campaign for a new set of boards the Teensy 3.5 and 3.6. These will be much more powerful ARM processors (120MHz and 180MHz Cortex M4 processors with floating-point units, so at least 2.5 times faster than the Teensy 3.2, more if floating-point is used much). The form factor is similar to before, but the boards are longer, taking up 24 rows of a breadboard, instead of just 14. The extra board space is mainly to provide more I/O, but there is also a MicroSD card slot. The designer is still dedicated to making the Teensy boards run in the Arduino environment, and the breadboard-friendly layout is very good for experimenting. PJRC is positioning the new boards between the old Teensy boards and the Linux-based boards like the Raspberry Pi boards. The new Teensy boards will have a lot of raw power, but not an operating system, though I suspect that people outside PJRC will try porting one of the small real-time operating systems to the board. The new boards are a bit pricey compared to the Teensy LC ($23–28 instead of under $12 for the Teensy LC), but still reasonable for what they provide. PJRC also has a history of providing good software for their boards. I probably need to get both a Teensy 3.5 and a 3.6 to port PteroDAQ to them—that looks like a $50 purchase. If the boards and the software are available in time for me do development on PteroDAQ by December, I might get it done—any later than that and I’ll have no time, as I have a very heavy teaching and service load for Winter quarter. I suspect that the new Teensyduino software will need a newer version of the Arduino development environment, which in turn would require a newer version of the Mac operating system (my laptop is still running 10.6.8), which in turn probably means a new laptop. I’m waiting to see if Apple releases a new, usable MacBook Pro in October, so there is a bit of built-in delay in the whole process. I’m not impressed with their recent design choices for iPhones and MacBook Air—I need connections to my laptop—so there is a strong possibility that I may be having to leave the Macintosh family of products after having been a loyal user since 1984 (that’s 32 years now). With his beautifully-colored classroom “noise-o-meter,” Mr. Jones knows when things are getting out of hand. When you were in school (or if you are in school) the teacher likely told the class to be quiet, perhaps repeating him or herself over an over during the day. The teacher, however, likely never really defined what is good and bad. Mr. Jones has finally solved this issue by creating a classroom “noise-o-meter” using an Arduino, an electret microphone, and a programmable LED strip. In order (apparently) too keep the class in line, noise is simply marked as green for “expected,” amber for “louder,” and “red” for too loud which corresponds nicely with more “traditional” VU meters. 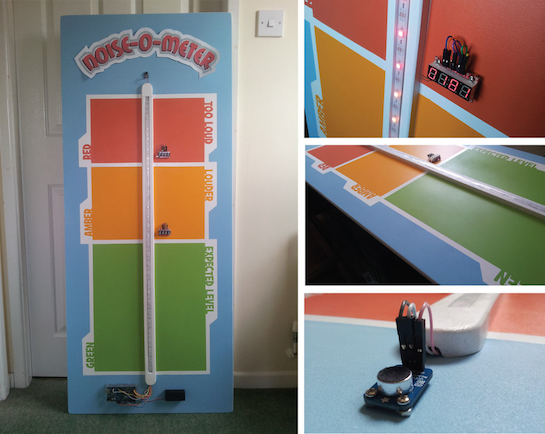 I built this a short while ago as an idea to use in a primary classroom setting. Poster displays are often used by primary teachers wanting to control the noise levels in their classrooms but I wanted to add technology to make it dynamic and responsive. The motivation for this came after seeing the Adafruit Digital NeoPixel LED Strip online and realizing its potential as part of a VU meter. Are you a teacher and want to build one for yourself? You can check out Mr. Jones’ Instructables page or his own website in a different format.